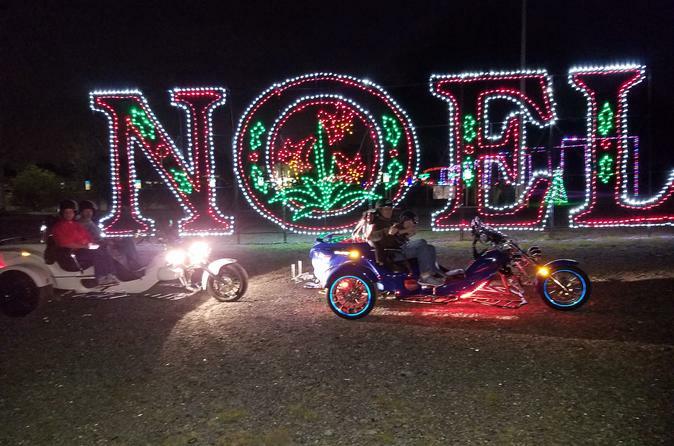 Choose from several evening departure times and get into the Christmas spirit while you ride around the Barrington Oaks neighborhood of Brandon, a popular holiday destination known for its elaborately decorated houses and lawns. Coordinate a pickup point with your personal driver/guide, then strap your helmet on and make yourself comfortable aboard your three-passenger motorcycle. Cruise through the streets of the neighborhood as you take part in this Tampa-area Christmas tradition. Take in the dazzling lights and experience the joy of the season with hot chocolate in hand. Listen to Christmas music while you ride on the back of the motorbike and snap pictures of your favorite decorations. Your 1-hour tour concludes at the starting point.